In many countries, pension reforms reduce the generosity of collective pensions and shift the responsibility for an adequate standard of living after retirement to individuals and their households. Individuals have to make more decisions than before on supplementary pension savings, on how to invest their DC pension assets, etc. Making such decisions is challenging, since retirement planning requires intertemporal decision-making under uncertainty and is subject to behavioural and psychological biases. Many studies in different countries have shown that the large majority lack the interest, knowledge, or skills to make such decisions in a way that is in their own best interest. Governments and the pension industry try to assist individuals in making the right decisions through pension communication. This paper focuses on experiences with pension communication, and the lessons to be learned from them. First, the paper provides an overview of the literature, addressing how pension communication is organized across countries and what can be said about its efficiency. 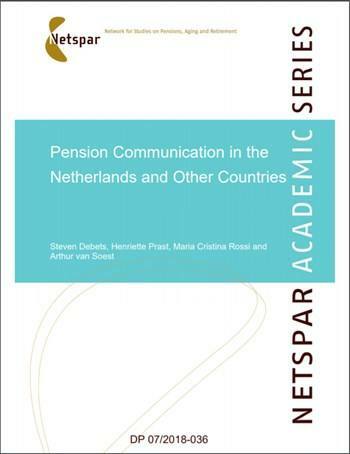 Second, using Dutch longitudinal data at the individual level, we analyse the relations between communication (receiving an annual pension overview), pension knowledge, and conscious pension decision-making. We investigate associations and aim at estimating causal effects exploiting the timing of events.